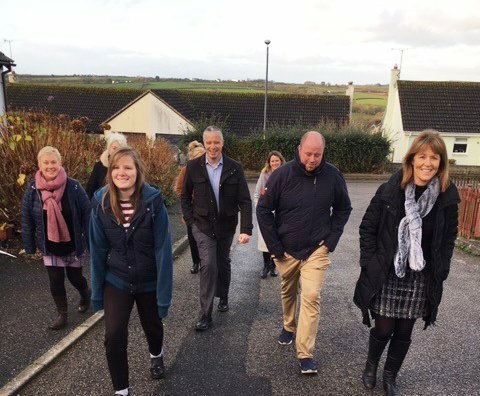 In our recent blog on how to stay healthy in an office job, Keith Jacka of Fitness Wild Helston gave us some advice on posture, moving around and how to break up your day to support your physical and mental health. This time, Keith is going to help us plan how to fit in exercise time outside of work, and make sure we are well fueled for our day with his recommendations for improving our nutrition and hydration. People often find it hard to plan in exercise time, especially in winter. Working a traditional 9-5, often with travel time as well, it is easy to find your day has gone before you’ve made it to the gym, pool or even out for a walk. Keith’s advice is to get started early. Go to bed an hour earlier, get up an hour earlier and work out before work. Swimming can be a particularly easy way to fit in a morning workout, as you can have a shower at the pool. Many offices now have showers, so could you cycle or run to work? Or, if you’re near Helston, you could head to one of Fitness Wild’s notorious 6am Group Sessions! If you’re not a morning person, the next best time is lunchtime. Maybe you can start or finish your day half an hour earlier, and extend your lunch break to give you time to fit in a workout. Even if you can only squeeze in an hour, could you do a HIIT session, go for a run, attend a Spinning class or run through a workout that covers the basics? Every training session does not need to be a full hour. It can be short, sharp but very effective in just 30-45 minutes. Consistency is the key and if you find yourself doing this regularly you’ll soon see the results you are looking for. If you struggle with motivation, evenings are not a great time to work out. You’ll be tired and more in the mood to get home and settle down for the evening. Working out first thing has a whole host of benefits, improving your mental focus during the day whilst firing up your metabolism. Of course, you’ll also feel just that little bit smug that you’ve already made the effort! Another challenge for the office worker is managing nutrition. If you are working out first thing, or at lunchtime, you also need to fit in a way of eating healthily. Breakfast is called “Break Fast” for a reason. It is important to break your overnight fast healthily. Keith’s recommendation for a quick and nutritional breakfast on the go, is to prepare a smoothie the night before, stick it in the blender before you leave the house and take it with you to drink in the car after your morning workout or once you get to work. Smoothies can be a great way to stuff in all the goodness that can be hard to eat – kale and spinach can be well hidden! Keith’s provided us with a smoothie recipe to get you started. Soak the nuts and oats in the milk overnight and blend it all together in the morning. At lunchtime, avoid the carbs. Sandwiches (or pasties if you are in Cornwall!) are guaranteed to make you feel sluggish and reduce your afternoon productivity. Instead aim for fish or meat and salad, and enjoy the nuts, seeds and healthy oils in dressings. If you look for it, you’ll find most places that will sell you a sandwich now also offer a low carb option. Whatever you do, get away from your desk. Going out for a walk, having lunch with friends in the park, even walking to the staff room will help. Wrap up a task before you break and take a moment to prepare what you are going to do when you get back. Any extra time taken will be made up for by the fact that you’ll feel more awake and alert after a bit of time out. Our last bit of advice is to consider your hydration levels. Buy yourself a water bottle and drink from it regularly. From unicorns and mermaids, to smart bottles connected to apps and trackers there are plenty to choose from. You can even set alerts on your internet browser to remind you to move and have a drink. Our staff have water bottles with the hours of the morning and afternoon on, to make sure we are drinking enough water across the day. Keep tea and coffee to the morning only. After midday, stick to water or herbal teas and you’ll find you sleep better and feel more relaxed in the evening. Be a bit careful with infuser bottles. Mint leaves can give you a tasty bit of a zing and wake you up. Citrus and fruit infusions can be harsh on your teeth and over acidic if you have too much of them. If you are running your office, or working for yourself at home, be aware of tempting snacks. Whether it is a “chocolate machine” or a “food altar” with gifts people have kindly brought in, or just your own fridge, there are often too many easy, unhealthy options at hand for snacking in between meals. Forms Plus and many other companies like us who hold Workplace Health Awards provide fresh fruit free to our staff.